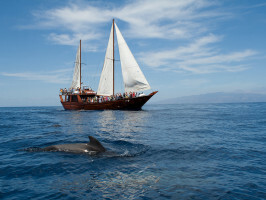 Set sail upon the Atlantic Ocean and spend the day cruising along the Southwestern coast of Tenerife. Explore the idyllic island’s wonderful waters which are warm all year round. 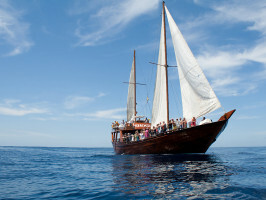 Make your way along Tenerife's stunning southwestern coast aboard the Shogun sailboat which is an authentic oriental masterpiece. On the Shogun trip you'll set out on a fun-filled 5 hour cruise on a boat kitted out with everything you can imagine to make the trip as smooth as it can be. 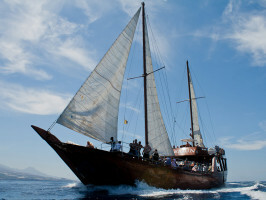 The boat was crafted for the private use of Arab Sheikh and the entire thing is made from teakwood. 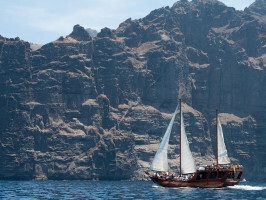 Spend a day in touch with nature as you sail along the unspoiled southwestern coast of Tenerife, heading for the magnificent cliffs at Los Gigantes where 600m rock walls drop right down to the sea. Whales and dolphins swish their way through the waters so keep your eyes peeled. This place is a wildlife haven and is home to: Pilot Whales Dolphins Mule, Rorquals, Sperm Whales, Killer Whales, Beaked Whales, Spotted Dolphins, Common Dolphins and Rough Toothed Dolphins. We'll drop the anchor in a small cove so that you can go for a swim or do a spot of snorkelling. Once you’ve built up an appetite, you can tuck in to a delicious lunch of paella, grilled chicken, a variety of salads and some bread and fruit. You get an unlimited supply of water, soft drinks, beer and sangria so you won’t go thirsty. Spanish, English, Italian, French and German.